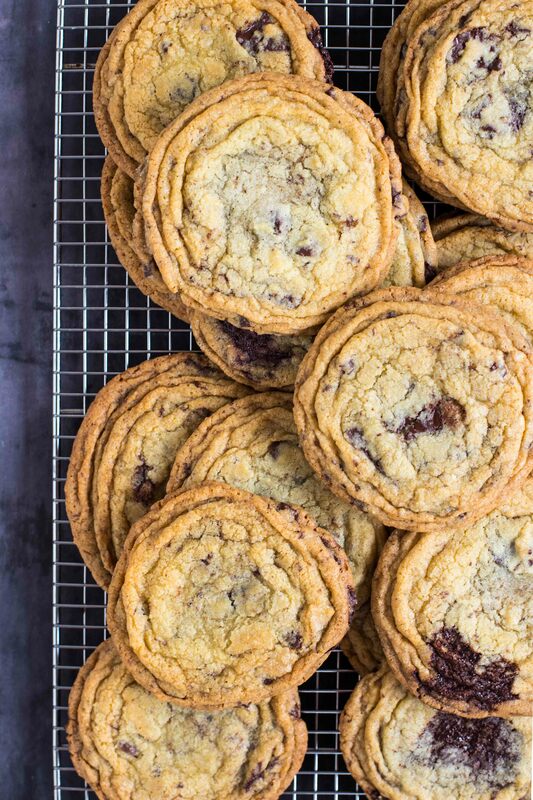 These cookies, made famous by The Vanilla Bean Blog, are really something special. First of all, they’re HUGE. Like deliciously huge. 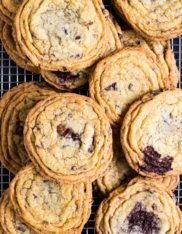 Next, these cookies aren’t your average chocolate chip cookie because there are stages to the cookie… crispy, crinkled outer edge that seamlessly blends into a perfectly gooey and chewy center. 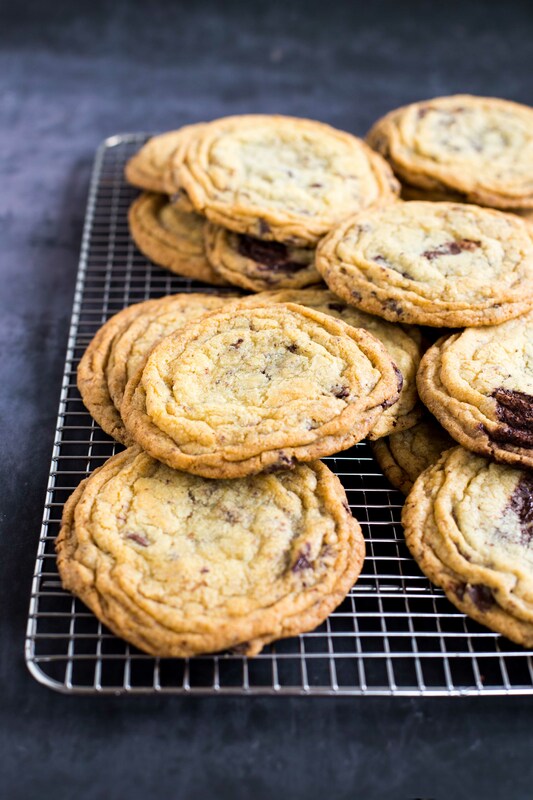 This Pan-Banging Chocolate Chip Cookie does live up to the hype. And yes, it does require quite a bit of pan-banging to get that perfect symphony of cookie textures. My kids (and husband) legitimately thought I was crazy with all the noise I was making, but it was worth it. 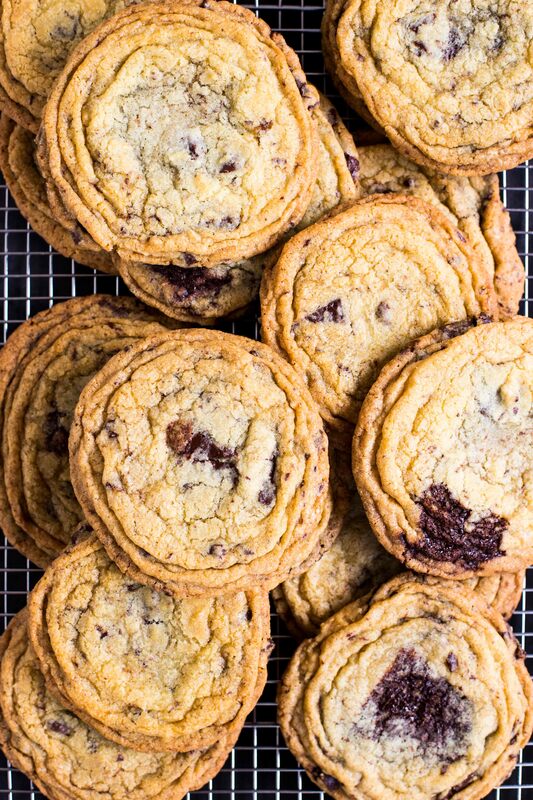 I doubled up on the batch of these cookies because I had some plans for the leftovers… homemade ice cream plans. So that recipe will be coming up soon. I love how summer, when we’re wearing the least amount of clothes, is the time that I feel it’s necessary to indulge in all these sweet treats. I somehow convince myself that I’m eating lightly during the day (i.e. my kids’ leftover chicken fingers at the pool) just so I can relax with a treat at night. Oh well, you only live once. Preheat the oven to 350°F and line 3 baking trays with aluminum foil, dull side up - this will help the bottom of the cookies become perfectly crisp. In a medium bowl, sift together the dry ingredients: flour, baking soda and salt - set aside. In the bowl of an electric mixer fitted with the paddle attachment, beat the butter until it's creamy. Next, add in the sugars and beat until the mixture is light and fluffy - about 2 minutes. Scrape down the sides and add in the egg, vanilla and water - mix until combined. Slowly add the dry ingredients to the wet ingredients and mix on low until it's combined. Add in the chopped chocolate and mix for a few seconds until it's mixed in. Use a spatula to finish mixing it in and to make sure everything on the bottom of the bowl is well combined. Use a standard ice cream scooper (about 1/3 cup) to scoop out evenly sized cookie dough balls and place them on the aluminum foil lined pans (4 cookies per pan). Transfer the pan to the freezer for at least 15 minutes before baking (alternatively, you can freeze the dough balls solid at this point and save them to bake at a later time). Place the chilled baking sheet in the oven and bake for 10 minutes - until the cookies are slightly puffed in the center. Lift the side of the pan up about 4 inches and let it drop back onto the oven rack so the edges of the cookie set and the inside falls back down. Continue to bake for another 2 minutes, until the cookies puff back up again, and then repeat the pan-banging. Continue this a few more times to create more rippled edges and until the cookies are golden brown on the edge and much lighter in the middle (16-18 minutes total).